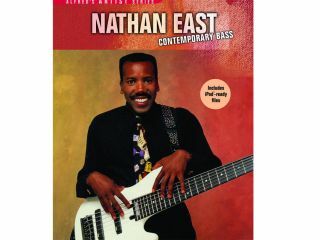 Okay, so he looks like he's holding a tobogan, but trust us, Nathan East can play bass. In fact, he's so good that he needs six strings -- and now he shows you what to do with them. Nathan East is best known for his work with Eric Clapton, and he has also performed and recorded with a variety of famous artists such as Elton John, Lionel Richie, Michael Jackson, Whitney Houston, Stevie Wonder, Bob Dylan, Ray Charles, Tom Jones, Sting...You get the idea: big stars actually know his name. In Contemporary Bass, Nathan shows you why he's the go-to guy when it comes to all things bass. He breaks down his unique style of playing, demonstrating how he builds impeccable chops, creates solos and grooves, plays walking bass lines, and interacts with a rhythm section. The DVD includes an in-depth interview featuring Nathan's candid confessions about his personal triumphs, his start in the music business, his breakthrough into studio playing -- and even his favorite superstar to tour with. Now, that alone has gotta be worth $24.95 (U.S. list price).